Coming to the north of Scotland? Below are some of my favourite places in the Highlands and Aberdeenshire. This is by no means an exhaustive list and it is by no means finished. I’ll add to the list as I remember and discover other places. Click on the links to go for related posts or to go to specific websites. 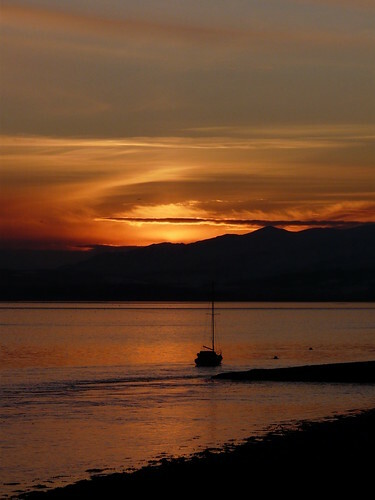 North Kessock – I might be a wee bit bias as I live here but Marco and I love wandering along the shore out past Charleston village and along towards Redcastle. Nice flat, quiet road for cycling too. The hills to the west make for some beautiful sunsets. Caledonian Canal – Pretty walk along the canal from the centre of Inverness. Lots of wild flowers in spring. Glen Feshie – A gentle but remote river walk in the Cairngorms. Scots pine, heather and clear water. 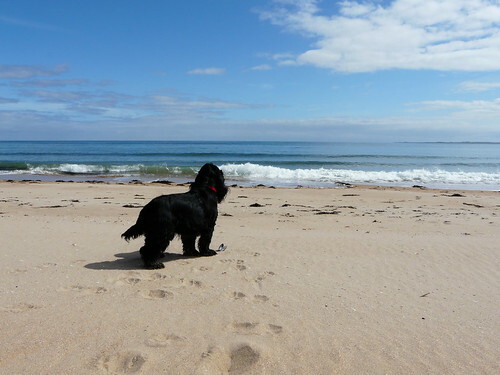 Dornoch Beach – Walk all the way to Embo on the beautiful sands. Loch an Eilean – A gentle walk around a lovely loch. It can be made longer by taking the path to Loch Gamma. Nice running route. Glentanar Estate – When I was a kid Glentanar was the place I wanted us to go every Sunday for a walk and a paddle in the river. 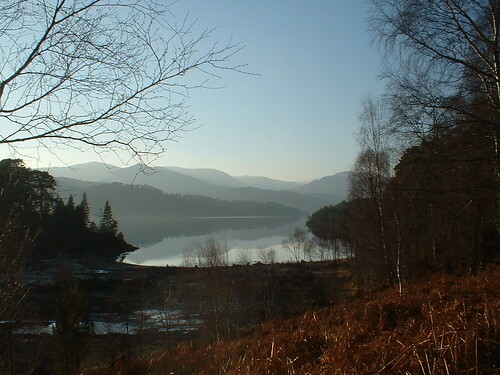 Beautiful Scots pine forests and walking routes of all lengths. Glen Affric – Perhaps the prettiest glen in Scotland. The walk right the way around the loch takes around five hours but there are shorter routes marked out too. 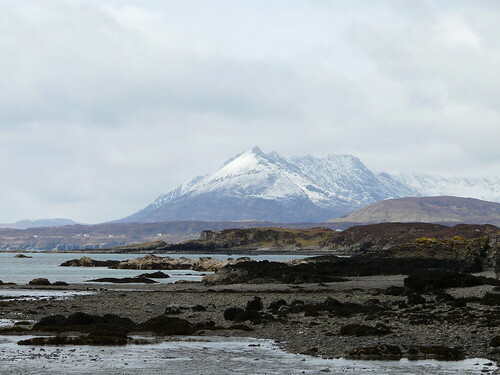 Skye – OK, so Skye is pretty big and I probably should be a bit more specific but, really, the whole island is just stunning. If you could only go to one place in Scotland, this is where I’d recommend you went. Chanonry Point – Want to see some bottlenose dolphins? Between Fortose and Rosemarkie is Chanonry Point, one of the best dolphin spotting points in Scotland. Connage Dairy – Our local cheesemakers. The Crowdie is my favourite. 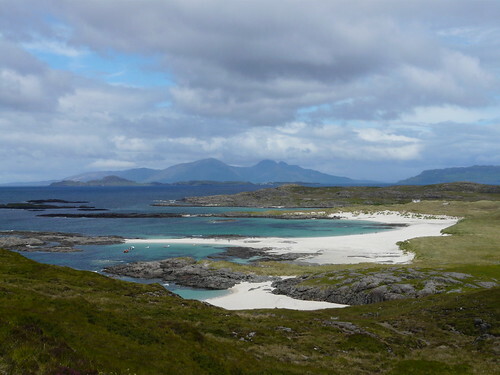 Achiltibuie – Home to the reknowned Summer Isles Hotel, Achiltibuie is a small, spread out village on the west coast. Stunning sunsets looking out over the Summer Isles. Ardnarmurchan – A beautiful penninsula on the west coast. Stunning beaches. Ullapool – Pretty wee town on the west coast. Great fish and chips. Picture here. Old Aberdeen – I’m a fan of the whole city but the old, university part of the town is all cobbles and granite and colourful wooden doors. The Anderson – Quirky, cosy pub/hotel with hearty food and an enormous beer and whiskey list. Dores Inn – Beautiful setting on the banks of Loch Ness. Exceptionally good food. See this post and this post and this post for pictures. Storehouse at Foulis – Canteen style restaurant with local art on the walls, good food and even better cakes. Lovely gift shop/deli too. 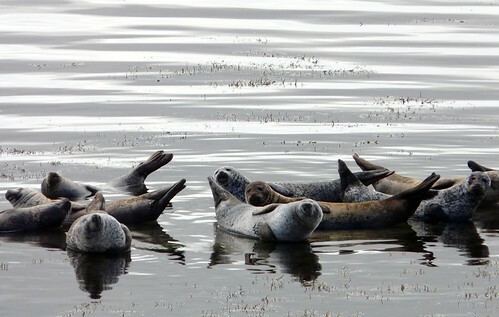 AND there are almost always a bunch of seals hanging out on the shore. Hootannany – Local ales, live music (traditional downstairs, rock upstairs) and a diverse crowd. Best pub in Inverness, in my opinion. North Kessock Hotel beer garden on a sunny summer’s day – Grab a pint and watch the dolphins jumping in the firth. 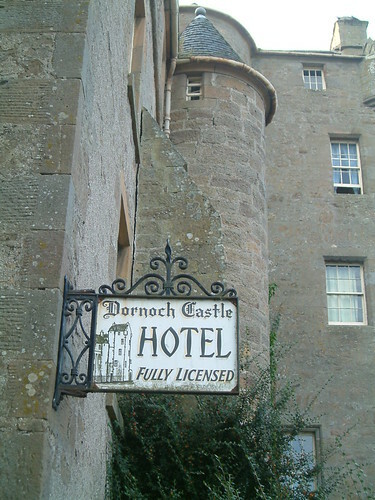 Dornoch Castle Hotel – Soooooo romantic. 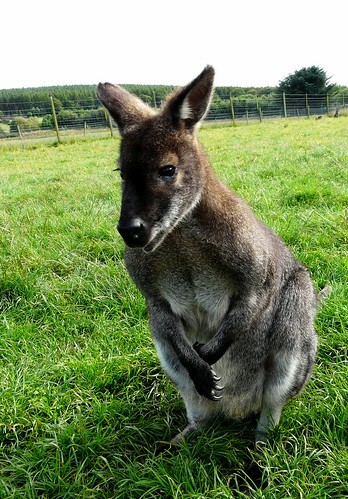 Black Isle Wildlife Park – The wallabies eat out of your hand so gently you’ll want to take one home. You can’t though. It’s not allowed, I discovered. Rothiemurchus Estate – Canoeing, mountain biking, quad biking and a whole lot more in a stunning location near Aviemore. Baxters Festival of Running – Every October. Take part in a marathon, a 10k or a 5k. Black Isle Show – Big agricultural show held every August. Lots of local stalls, exhibits, farm animals and dancing. Great idea-and a chance to show some of your lovely photos! great post – of course I would love to visit that area but failing that it always lovely to read about these places and dream – the photo of the wallaby in a post about scotland gave me a laugh! Clearly we need to plan another trip to Scotland. Johanna, the wallabies live just a few miles from me and really are just the most gentle creatures imaginable. Are they that polite in their homeland, I wonder? I’ve always been a fan of Scotland. My mother’s family are from Fife and my Grannie Robertson is responsible for the blog I am currently writing. I know Arran quite well and parts of Perthshire. One of these days I shall pack up my life and retire up that way! Thank you, Wendy, for your beautiful blog! We spent a blissful term in Fife in 2009, and I found your blog after we returned to the States and I was pining for Scotland. I’ve been a loyal reader ever since! We’re about to return to Fife for the Christmas holiday, and I’m so thrilled to have this new “tab” about places to go/see in the North, as we didn’t get up there enough before. So we will probably try to make a trip to Inverness and environs! Don’t forget Dunnottar Castle – a great place to visit although I am a wee bit biased as I’m originally a Stoney quine. And the Carron Restaurant for an Art Deco experience. Wallabies are usually fairly gentle especially if they are in a touristy area and used to human contact – it’s the ‘roos you have to watch out for. They can be quite aggressive and they’re big!! Back in 2003 I went for a 3 week holiday in Scotland. Rented a car and drove around the Highlands. My best memories are visiting the Orkney Islands, walking to Faraid Head from Balnakeil, visiting the Castle of Mey, taking a boat to Handa Island, helping a blind sheep find its way home and the experience of driving on Highland roads (plus many more). I just discovered your blog today and have enjoyed your photos and super scrumptious recipes. My people are from Stirling, only been there once, and took in the castle. Re Places to Visit – can I suggest Balgove Larder, just before St Andrew’s – FANTASTIC for good and amazing deli. Thanks to your recommendations I have been to Glen Affric and Ullapool in the last day. I am traveling with friends and we have all lived here before for a year or two and visited often but we are seeing new wonderful things thanks to your suggestions. A beautiful sunset in Ullapool after a grey day seemed like a miracle but I know that is one of the many wonders of Scotland. Hi Shaun. Highland Wholefoods or the health store in the centre of Inverness have a decent selection. There used to be a shop in the Victorian market too but I’m not sure if it’s there anymore.